The calendar has turned to February which means that Valentine’s Day is just around the corner. It is amazing how no one thinks about the sweetest holiday of the year until the calendar says “February” but then they procrastinate on gift buying until the last minute. Every year, we see faces pressed against the glass front door long after closing time, tapping in hopes that someone might open up and save them from coming home empty handed on Valentine’s Day. So, of course, we do save as many last-minute shoppers as we can. We know no one wants to tell their sweetheart they were too busy to buy a Valentine’s present. Certainly, there is good reason those last-minute folks are pressed against the glass at Chocolate Pizza Company. We have the best chocolate and the best Valentine’s gifts. But don’t take our word for it, read Forbes. 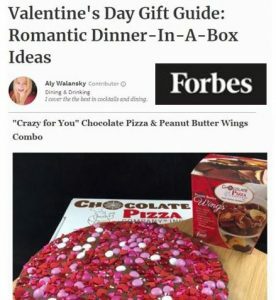 The 2019 Forbes Valentine’s Day Gift Guide focused on romantic dinner-in-a-box gifts. They couldn’t resist the playful twist of gourmet chocolate in a pizza box. 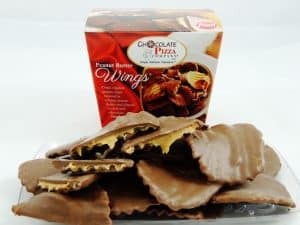 So, listed among their recommendations of caviar and filet is our “Crazy for You” Chocolate Pizza & Peanut Butter Wings Combo. “Chocolate Pizza Company has a really fun Valentine’s surprise for those of us who prefer dessert for dinner,” is the opening declaration. Chocolate Pizza was made for Valentine’s. Rich milk or dark chocolate blended with homemade English toffee forms the crust. Chocolatiers then top it with red, pink, white chocolate candies and sugar hearts. The bright, cheerful color scheme screams Valentines. Crazy for You comes served in a custom pizza box for fun. But there is plenty more confectionery jewels in the Chocolate Pizza Company lineup. 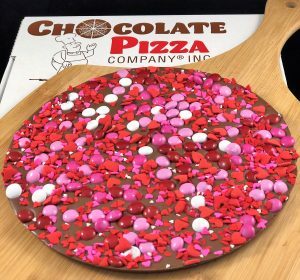 The Valentine’s Avalanche Chocolate Pizza is loaded with chocolate and peanut butter candy favorites. Heart-shaped Chocolate Pizzas are hand-decorated with “Happy Valentine’s Day” or “Love You”. You can even have a custom Chocolate Pizza made with you own words scripted in white chocolate. Gift baskets make a wonderful surprise for your sweetheart. Whether it is the “All My Love” basket and pizza or the elegant Sweet Thoughts gift box, these always impress. Chocolate Pizza Company has been featured on Food Network, Hallmark Channel, CNBC, CMT and in other major media including Forbes. Owner, Ryan Novak, started with the company at age 15 as a dishwasher. By 21, he was the owner. Ryan’s vision has transformed a small-town chocolate shop into an emerging national brand. The company’s website receives orders from 6 continents and its gourmet chocolate has been enjoyed by A-list celebrities, hall of fame athletes, rock and roll legends and top business and political leaders.